A flood-damaged home needs special care to remove mold safely and effectively. 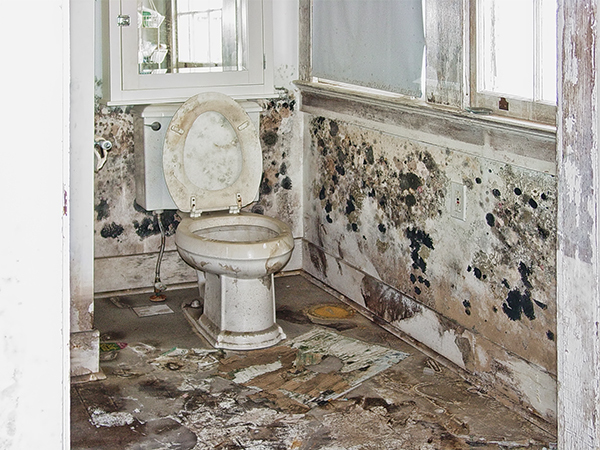 Mold begins to grow on materials that stay wet longer than two or three days. 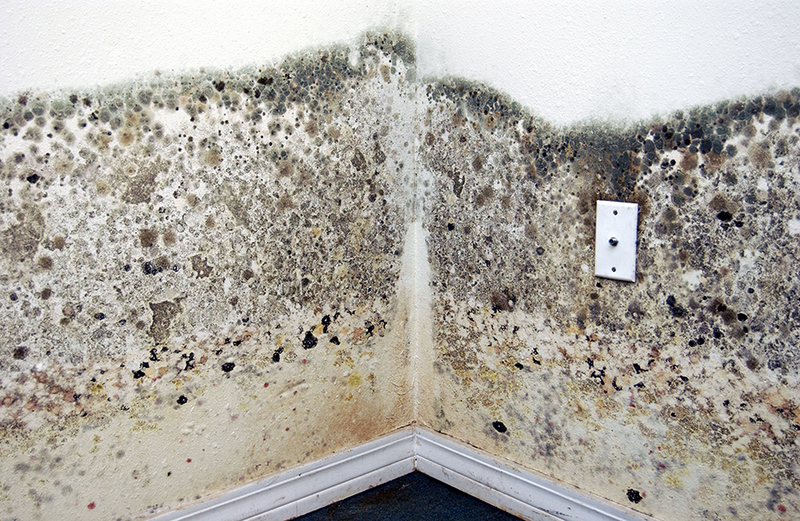 The longer mold grows, the greater the health hazard and the harder it is to control. So, as soon as it is safe to return, don’t delay cleanup and dry out. Take photographs before cleaning up for insurance purposes, and get started. Do not wait for the claims adjuster to see your home before removing wet and moldy materials. Most homeowners’ insurance policies do not cover mold damages or cleanup costs, but flood insurance may cover it. Molds are a type of fungi. They serve as nature’s recycler by helping to break down dead materials. Molds produce tiny cells called spores that float and spread easily through the air. Live spores act like seeds, forming new mold growths (colonies) when they find the right conditions – moisture, nutrients (nearly anything organic) and a suitable place to grow. Of these, moisture is the key factor – for growth and for control. 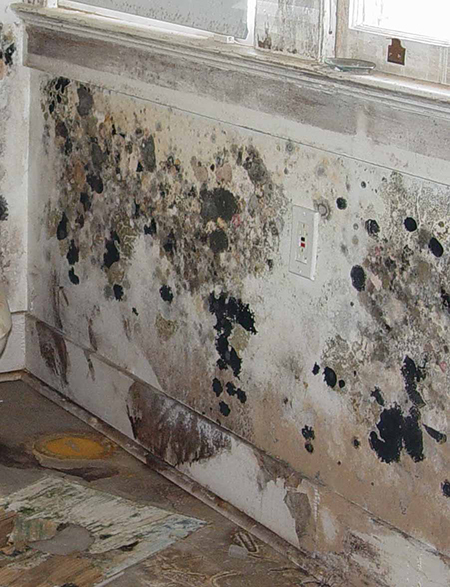 Some people are much more sensitive to mold than others, but long-term or heavy exposure is unhealthy for anyone. Mold can trigger allergic reactions and asthma attacks, may lower resistance to illness or have other effects. Young children, the elderly and the ill are most vulnerable. Some molds can make toxins that can be carried in live or dead spores and fragments. “Black mold” is a misleading term since many molds are black. Mold testing in a home is not usually needed and is rarely useful to answer health concerns. Some insurance companies and legal services may require sampling for evidence. Professional mold remediation contractors may test before and after cleanup to measure the cleanup’s effectiveness. If you hire a contractor to remove mold, seek a licensed mold remediation contractor with special training and equipment such as HEPA vacuums and dehumidifiers. Get in writing the cost, methods and steps to be used. Compare their procedures with the do-it-yourself guidelines below and to EPA’s Mold Remediation in Schools and Commercial Buildings available online at www.epa.gov/mold. Also, review the CDC’s Mold Prevention Strategies and Possible Health Effects in the Aftermath of Hurricanes Katrina and Rita available online at www.cdc.gov. Follow these guidelines, and also refer to the EPA publication, A Brief Guide to Mold, Moisture and Your Home, at www.epa.gov/mold. 1. Wear protective gear during cleanup. People are mainly exposed to mold by breathing spores and skin contact. Wear gloves, goggles and a respirator rated N-95 or higher. Some types have valves to make it easier to breathe. A properly fitted half-face or full-face respirator with filter cartridges provides greater protection and comfort than the dust mask types. 2. Isolate work area and ventilate to outdoors. Disturbing mold colonies during cleanup can cause a huge release of spores into the air, so seal off the moldy areas from the rest of the house. Open windows, and don’t run the central air system during cleanup. Tape plastic over air grilles, and drape plastic in the stairwell if the second story is dry and clean. If power is on, put a box fan in a window to blow out and exhaust mold-filled air to the outdoors. 3. Remove moldy, porous materials. Porous moldy or sewage-contaminated materials should be removed, put in plastic bags if possible and thrown away. To reduce the release and spread of mold spores, it is helpful to cover moldy material with plastic sheeting before removing it. Remove all flooded carpeting, upholstery, fabrics and mattresses right away. It’s best to discard them, but if you hope to salvage a valuable item, have it cleaned, disinfected and dried quickly outside the home. Never reuse flooded padding. Remove all wet fibrous insulation, even if wallboard appears to be dry. Wet insulation will stay wet far too long, leading to the growth of hidden unhealthy mold and decay fungi inside the walls. Cut wall covering above the level that was wet; water can wick up above the flood level. Remove all moldy, porous materials, including gypsum wallboard, processed wood products, ceiling tiles and paper products. Clean and sanitize plaster, wood paneling and nonpaper-faced gypsum board walls that dried, are in good condition and have no insulation in the wall. It’s best to remove multiple layers of paint on old plaster to aid drying. There is a risk of mold on the backside, however, that can release spores into the home through air leaks in the walls. If you choose to restore these materials, seal interior gaps with caulk. Remove all vinyl wallpaper, flooring and any other materials that hamper drying of framing toward the interior space. All interior side plastic sheeting or foil-faced insulation should be removed. 4. Clean and disinfect. Surface mold can be effectively cleaned from nonporous materials such as hard plastic, concrete, glass and metal; solid wood can also be cleaned since mold cannot penetrate solid wood but grows only on the surface. Cleaning should remove, not just kill, the mold, because dead spores can still cause health problems. After cleaning, you may choose to use a disinfectant to kill any mold missed by the cleaning. If there was sewage contamination, disinfection is a must. If you disinfect, follow label directions and warnings, handle carefully, wear rubber gloves, and never mix bleach with ammonia or acids. Many disinfectants, including bleach, can kill molds but do not prevent regrowth of new colonies. Remove any sediment. Hose out opened wall cavities, if necessary. Wash dirty or moldy materials with nonphosphate all-purpose cleaners, because phosphate residue is mold food. Rough surfaces may need to be scrubbed. Rinse, but avoid pressure spray that can force water into materials. Use a HEPA filtered vacuum (not a regular vacuum) to remove dust and mold residue, if possible. Disinfect wall cavities and other materials after cleaning to kill any remaining fungi and bacteria. Soil can make some disinfectants, including bleach, less effective. On colorfast, nonmetal surfaces, you can disinfect with a solution of ½-1 cup household chlorine bleach per gallon of water. Do not use in the air conditioning system. You can use milder, less corrosive disinfectants, such as alcohols, phenolics and hydrogen peroxide on materials that may be damaged by bleach. 5. Consider a borate treatment to resist termites and decay. Solutions that penetrate wood over time are more expensive but offer better protection. Other mold inhibitors, such as latex zinc paints and fungicides, may also help inhibit mold growth during drying. Do not apply sealants or coatings that can hamper drying. Framing materials that are difficult to clean or replace, such as sheathing and rough surfaces, can be painted with a fungistatic latex coating to help encapsulate remaining mold and reduce its release into the air. 6. Flush the air. After cleaning and disinfecting, air out the building. Use fans in windows to pull mold spores to the outdoors. 7. Speed dry. Dry all wet materials as quickly as possible. Close windows and air condition or heat, run fans and use a dehumidifier, if possible. If there is no power, keep windows open. 8. Remain on Mold Alert. Continue looking for signs of moisture or new mold growth. New mold can form in as little as 2-3 days if materials stay wet. Wood and other materials that may look dry can still be wet enough to support new growth. If mold returns, repeat cleaning and, if possible, use speed drying equipment and moisture meters. Regrowth may signal that the material was not dry enough or should be removed. 9. Do not restore until all materials are dry. Check wood moisture content with a reliable moisture meter. It’s recommended to wait until wood moisture content drops to 15 percent before replacing insulation and wallboard. Never restore when any wood exceeds 19 percent moisture content, the danger zone for decay fungi. Do not use vinyl wallpaper, oil-based paint or other interior finishes that block drying to the inside. Walls finished with gypsum wallboard and latex paint allow continued drying, especially when air conditioning in warm weather. 10. Restore with flood-resistant materials. If possible, "wet floodproof" your home so it can better withstand a flood. Use closed-cell spray foam insulation in walls, or rigid foam insulating sheathing that does not absorb water. Choose solid wood or water-resistant composite materials. Elevate wiring and equipment. Consider removable, cleanable wainscoting or paneling. Use paperless drywall that does not provide a food source for mold. Use restorable flooring such as ceramic tile, solid wood, stained concrete, etc.